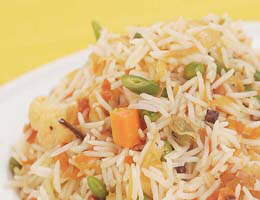 Fragrant rice with medley of fresh vegetables. Heat olive oil in a thick-bottomed pan. Add cumin seeds, green cardamoms, black cardamoms, cinnamon and cloves. Once they start to splutter, add onions and fry till translucent.Add tomatoes and cook till oil separates. Add salt and three cups of water and bring to a boil. Add carrots and cook for five minutes. Add drained rice to the pan. Once the mixture comes to a boil add green peas, cauliflower florets, French beans and salt. Reduce heat and cover the pan. Cook till rice is completely done. Uncover the pan when the rice is cooked and stir lightly with a spatula so as to ensure that no lumps are formed.